(Nanowerk News) In research published in WIREs Computational Molecular Science ("GENESIS: a hybrid-parallel and multi-scale molecular dynamics simulator with enhanced sampling algorithms for biomolecular and cellular simulations"), scientists from RIKEN, Nagahama Bio Institute, and Michigan State University have developed a software package called GENESIS (GENeralized Ensemble SImulation System) which is designed to perform molecular dynamics (MD) simulations for studying large biological systems containing 10 or even 100 million atoms. Image: T. Mori (Theoretical Molecular Science Laboratory) This software promises to open a new era in computational biophysics and biochemistry by allowing scientists to make connections between molecular and cellular-level understanding and to integrate experimental knowledge with theoretical and computational insights. 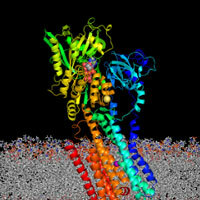 Although other programs are now available that can perform MD simulations of biomolecules such as proteins, DNA, membranes, and oligosaccharides, a key advantage of GENESIS is its superior computational efficiency on massively parallel supercomputers like the K computer. Using GENESIS, more than ten thousand CPUs can be used in parallel without any reduction in the computational efficiency. This has been achieved thanks to the developments of several new algorithms, including the inverse lookup table, a new domain decomposition scheme, and the use of hybrid (OpenMP + MPI) parallelization. In the first molecular dynamics simulation, performed by researchers at Harvard University in 1977, protein dynamics were simulated in vacuum conditions. Beginning in the 1990s, simulations of molecules in water or a lipid bilayer have been possible due to advances in MD algorithms and improvements in computer performance. To investigate biomolecular dynamics and function within more realistic cellular environments, much larger biological systems need to be simulated in milli- or microsecond time scales. GENESIS has the potential to be a good computational platform in this context, as it will help to break down the current limitations facing biological MD simulations in terms of size and time. The first version of GENESIS is now available as open source software under the GPLv2 license from the website of the Computational Biophysics Research Team, RIKEN Advanced Institute for Computational Science (AICS).